Immaculately constructed knife in a form-factor that is easy to carry and large enough for virtually every task. Our testing team loved almost everything about the Benchmade Mini-Barrage 585. Its dimensions and features strike a balance that we all could appreciate. It slides virtually unnoticed in the owner's pocket but provides ergonomic support for the user to apply plentiful pressure to the blade. Testers loved the assisted-opening blade, brilliantly positioned pocket clip and smooth, intuitive blade lock. The blade can also be locked closed, which is perhaps the only aspect of the knife that we found to be a bit annoying. There's a learning curve to properly engaging and applying the mechanism that locks the blade closed. It is also a sizable investment. 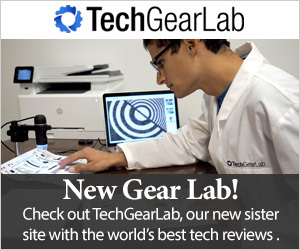 To realize the value of this high-tech tool we recommend treating it like a piece of technical equipment. Our testers recommend the Benchmade Mini-Barrage 585 for anyone ready to invest in quality construction and service and then treat this knife like your smartphone or wallet. It'll be just as critical to your daily life, and just as easy to lose. If you love the design, construction, and quality of this knife, but require a larger blade, check out the Benchmade Barrage 580, which is a larger version of the Mini. The Benchmade Mini-Barrage is indeed a little smaller than a standard, "full size" pocket knife. However, our testers agree that it strikes the perfect balance of compact carriage and ergonomic structure. The Benchmade brand makes excellent blades and has for a long time. While the Mini-Barrage is our top scoring product, there are others that come close. We are betting that the Mini-Barrage will serve most consumers very well, especially if those consumers take advantage of the potential customizations Benchmade enables. However, in a close-scoring field, it is also likely that one of the other top-scoring products may be a little better for you. For this investment, investigate at least a few of our top scoring knives before you "pull the trigger." While the handle is slightly down sized, it still fills a loosely clenched fist. The contours and size fill the users hand and allow the application of significant pressure. 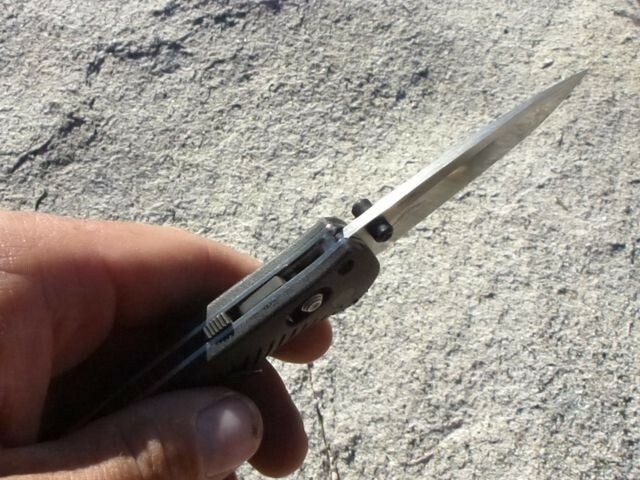 While it's true that all modern pocket knives come with adequate steel, it must be noted that the metal and construction of the Mini-Barrage blade is above par. Benchmade puts lots of care and work into every design. The blade arrives polished to a sheen. The experience of cutting with a brand new (or newly factory reconditioned - see the section on "Value" below for an explanation of Benchmade's LifeSharp program) Benchmade Mini borders on sensual. The edge and sides of the blade seem to propel themselves through delicate and durable tasks alike. Never in our testing, whether cutting soft and corrosive things like tomatoes or robust and inert items like sun-faded climbing rope, did the Mini-Barrage blade show a single sign of weakness. The blade is just the right length to whittle on a stick or slice through a block of cheddar. The blade's "depth," somewhat greater than our Best Buy selection Kershaw Leek, lends stability and confidence in extended usage and heavier tasks. The blade is remarkably similar to the cousin Benchmade North Fork. With virtually identical external dimensions of blade and handle, the North Fork and Mini-Barrage are very close "competitors." The difference, however, is in the populations they are targeting. Both are decent for everyday carry, but the Mini-Barrage is a little more versatile. It comes with more customization options; for instance, it comes with either 154CM (As we tested it) or the more expensive S30V blade steel. The North Fork only comes with the S30V. "By the numbers" then, the North Fork is a little better blade than the tested Mini-Barrage. However, in extensive use of both, we have found no notable difference. 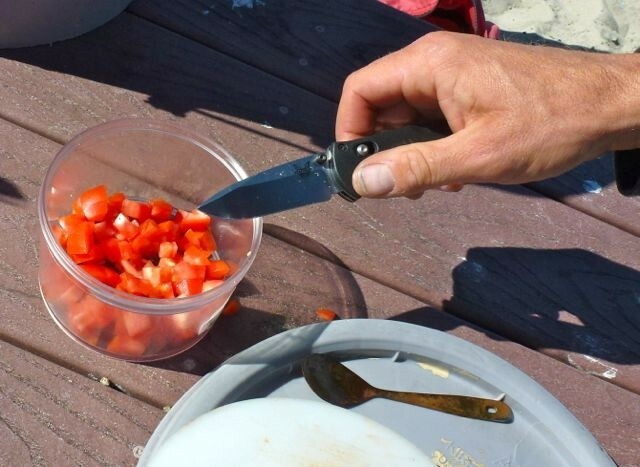 Each knife we reviewed fell somewhere on the spectrum between good ergonomics and portability. In short, smaller knives are more portable, while we've found that larger knives are more useful in-hand. Each of our testers found that, for every day, pocket-clipped usage, the Mini-Barrage 585 struck the perfect balance. It isn't the smallest, nor is it the largest. The handle fills a clenched fist and sturdily delivers force to the blade's leading edge. Gentle curves on the handle leave no pressure points to the user. While Benchmade uses flashy and reliable materials and equips the Mini-Barrage with a smooth-operating assisted opening function, it is the location of the pocket clip and its modular design that stands out. The Mini-Barrage, just like cousins Benchmade Griptilian 551 and North Fork, can be configured for left or right pocket carry. When stored and clipped to the edge of a pants pocket, the knife can be pulled out and the blade deployed in one smooth motion. While self-defense types will look to this feature as a safety benefit, the actual benefit is in purely pedestrian usage. Trust us when we say you will use the knife far more often when you fully embrace the convenience of this simple design subtlety. The Spyderco Tenacious takes this modular pocket clip feature a step further, offering left and right-hand options as well as "tip up" or "tip down" pocket carry, depending on which set of holes you screw the pocket clip in to. Finally, the Mini-Barrage's assisted opening function works intuitively while the locks (locking the blade both open and closed) function smoothly and reliably. There is an initial learning curve to disengaging the lock that holds the blade closed. Thankfully, if you don't need that feature, you can leave it unlocked with no inconvenience. All the assisted opening knives we tested have locking blades. This is the Kershaw Leek and the SOG Trident Elite. Like its performance in the Ergonomics category, nothing about the Mini-Barrage's portability stands out. It isn't the smallest or lightest knife in our test. It is far from the thinnest. However, again, it seems to strike the perfect balance of size and function. If you carry a smartphone in one front pants pocket, a small set of keys and Mini-Barrage in the other it will balance out your stance and equip you for anything a day out and about might require. Unlike in the other scoring metrics, there are products with clear advantages over the Mini-Barrage. For ultimate portability, whether your pocket space is indeed cluttered or you don't justify carrying around a full-size pocket knife, the Top Pick Victorinox Classic is much much smaller, with more features for day-to-day use. Both Best Buy knives, the Kershaw Leek and Opinel No. 8 are much smaller than the Mini-Barrage. Interestingly, though, the Leek isn't much lighter than the Mini-Barrage, but the Opinel is a fraction of its mass. The best-designed equipment comes out of the package ready to use and never again prompts another thought to its construction or durability. With assisted-opening springs, dual thumb-studs for blade opening, Benchmade's proprietary Axis blade lock mechanism and a tab for locking the blade closed, the Mini-Barrage solves some potential failure points in a small package. The miniaturized machinery proves to be durable and reliable. In none of our testing have we had any trouble with the performance of any of the Mini-Barrage's features. 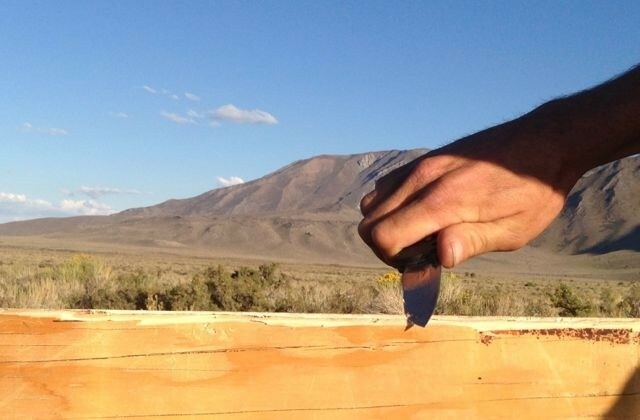 Indeed, the other Benchmade knives in our test offer competitive construction quality. What we find notable about the Benchmade products is that they manage to be strong and durable, without feeling heavy. The Spyderco Tenacious, for instance, is just as beefy and well-built as the Benchmade's, but it is noticeably heavier than the similarly sized Benchmade Griptillian 551. The Kershaw Leek is well built like the Editors Choice Mini-Barrage, but it is considerably smaller in-hand and only a fraction of an ounce lighter. The Buck 110 Folding Hunter has a sturdy construction but is way heavier than the Mini-Barrage. The Best Buy Opinel No. 8 approaches construction quality from a more delicate angle than the Mini-Barrage. Detail of the mechanism that locks the knife CLOSED. With an assisted opening blade, this function is crucial. This way, in a crowded pocket or tousled purse, the knife won't inadvertently come open and inflict damage. The lock works reliably. This model is a simple knife. The blade is the feature, with nothing else. The Mini-Barrage is well suited to the discerning user who will carry and keep track of this high quality, expensive piece of equipment. Those who appreciate quality will be pleased with a lifetime of service from the tool and Benchmade as a company. They stand behind their knives and will sharpen your Mini-Barrage 585 for a small fee whenever you want. The Benchmade Mini-Barrage is almost overkill for fishing usage. However, if you carry a knife for everyday carry anyway, why not one that will slice almost effortlessly? The Mini-Barrage 585 is expensive. You get what you pay for, but to realize that value one must keep track of the knife for a long time and keep up with maintenance. Whether you sharpen it yourself or employ a professional service, realize that the Mini-Barrage, just like all knives made, requires periodic tuning of the blade edge. No knives, no matter what the manufacturer says, will hold a usable edge indefinitely. Furthering the value of any Benchmade knife, know that they offer their generous and industry leading "LifeSharp" service to all knife owners for a very affordable fee. Just return your knife whenever you wish. It will be returned to you sharpened and polished to like-new status. The Benchmade Mini-Barrage 585 is an excellent, precision-crafted piece of useful equipment. Those willing to make the initial investment will not be disappointed. We heartily recommend this knife. Amazon $127.50 - 12% off! REI $130.00 - 10% off!